Importing Digital Signatures into and Acrobat PDF? How to import digital signatures into an Acrobat PDF document? A friend has exported a digital signature and has sent it to you. 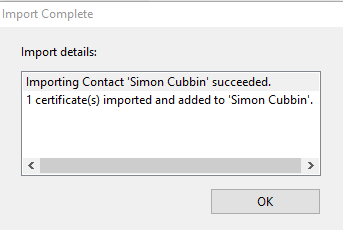 You now want to import the certificate on your machine so that you can install it. In the Identities & Trusted Certificates section click on More. 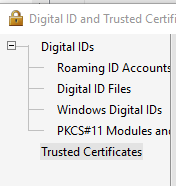 Click Trusted Certificates from the list on the left. Click Import at the top of the box. 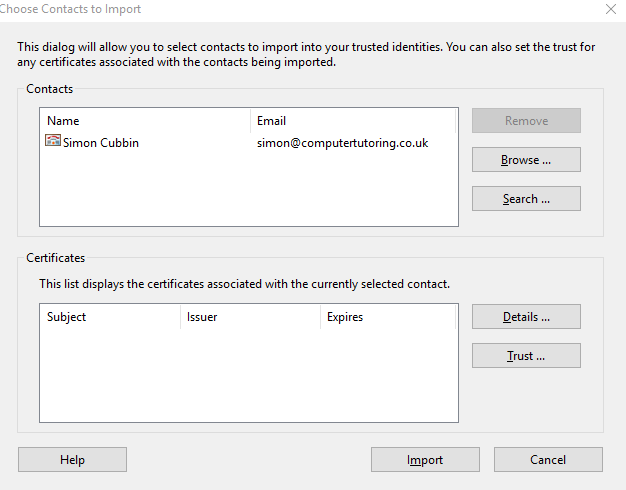 In the Choose contacts to import box click on the browse button and choose the FDF file that your work colleague has sent you. Click on OK and now every time that the same colleague signs and sends you PDF documents you can check whether or not they were in fact the person who signed the document.